Every time I go to the ban, I’m always surprised to see a long queue of people paying for their DStv subscriptions. They come into the bank, walk to the slips counter, figure out which one is for DStv payments, walk over to the queue and reserve their spot, go to an available counter, fill in their DStv deposit deposit slip, come back to the queue, then wait some 15 or so minutes before they can finally make their payment. And as if that’s not enough pain already in the year 2016, even after paying, they can’t check immediately if their account has been credited because they’re not at home. They might later have to start calling DStv, or the bank to check why their account is still not credited. At my bank, this DStv queue is usually longer than the regular banking queue. I watch and wonder if these people have heard of mobile money and how it, for some 2 plus years now, has already erased this painful process from their lives. That was actually a side observation. The interesting thing is that even with the convenience of mobile money menus, paying for bills can get better. In the case of the dominant mobile money service, Ecocash, I used to need to remember the DSTV biller code, to just make the payment. Some string of 5 numbers that I had to have written down somewhere. Better than banks but still not year 2016 easy. Codes in memory aside, I still need to go through at least 5 menus to pay DSTV using Telecash. Cellulant, a local VAS company, says it’s taking that little remaining pain away. Their proposition is this; a simple USSD number to dial, *365#, and you’re in. The first menu you see immediately has DSTV as an option, Prepaid Electricity, TelOne, Airtime etc… No more biller codes and going through several menus. Cellulant tell us their service went up last week and is available on all 3 mobile networks Update: on Econet and Telecel at the so far. If you’re wondering where the actual money that you pay comes from – it’s the same mobile money wallet you already have with your mobile network operator. 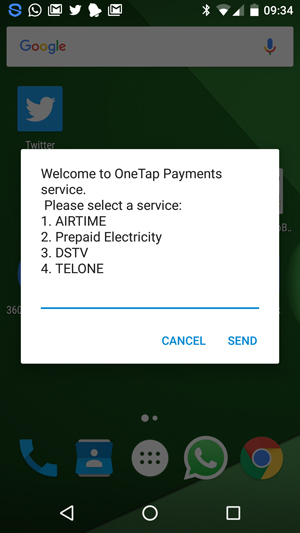 In a sense therefore, Cellulant’s service is about getting you directly into whatever service you want to pay for, but after that one still has to go into their usual Telecash or Ecocash menu and experience the many menus pain. The key we see is that Cellulant has a focus on bill payments that ensures one USSD for, hopefully soon enough, all the bills in your life. Cellulant Country Manager, Angela Centra says they will be introducing more ‘billers’ in future and that when they increase, the convenience of immediately accessing doesn’t go away because you can personalise your menus to show your most important billers. Cellulant is actually not new at all in Zimbabwe. They’re a Kenyan tech company but have been in Zimbabwe for at least 3 years now, working mostly B2B with banks and mobile operators. We interviewed both the local and continental executives and will be posting a podcast of that interview later today. I hope this new USSD service will finally pull those thousands still queuing at the banks. Or at least I hope Cellulant figures out how the mobile operators failed to get the message across to these people and do a better job of it. I tried to use this services and i got a message that one tap service coming soon. The service is up, so you can pay for your ZESA tokens but we will be adding additional merchants soon as noted in the article. One step further. We are getting there. Brilliant service just tried out for my ZESA Bill and it works like a charm and the charge was 40c…thanks love the creativity hope its the beggining of greater things to come…Convenience made easy for sure..Good riddens to the long queues, Thanks TechZim for keeping us updated with cureent IT trends! What a clever way of going round the problem! Congratulations are indeed in order. Worked flawlessly for me the first time around. Great service guys. I do sincerely hope that your customer service will be on spot always as is now.